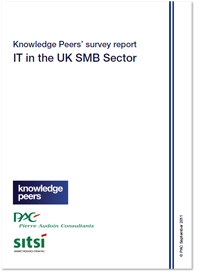 New information technologies, the Cloud and increasing use of personal mobile devices by staff for work are all having a transformational effect on UK SMBs. Knowledge Peers and Pierre Audoin Consultants surveyed business leaders about their attitudes to these technologies, the growing trends of working from home, and of staff using their own devices at work. This report summarises our findings from this survey, showing that most business leaders view IT as strategic and critical to their business, but still recognise that there are a number of challenges involved in the adoption of these technologies.